Favorite Sport (and why): "Volleyball is by far my favorite sport. I grew up loving volleyball and wanting to follow in the footsteps of my parents when I was young. In middle school, I was so excited to finally play volleyball, and my love for the sport grew and grew. Into high school, when I was taller and I could jump higher, of course it was fun to pound the ball down to the ground, but the support of my teammates, coaches, and love from volleyball fans is what I really love. Now after my senior season, knowing I’ll be going on to play in college as well, I have no doubt that my passion will continue to grow." Best Part of High School Sports (and why): "The best part about high school sports is all of the memories you make. After school, you won’t see most of the people you went to classes with, and some people you may even forget, but the memories that you make doing something you love will always stick with you. Whether they’re good or bad memories, it’s way better than only remembering homework and lectures." Best Advice from a High School Coach: “The most important move is the next one.” - Coach Jim Herman. "Don’t focus on past mistakes. The only way you can change the game, or your future outside of sports, is by getting ready for your next move." Most Memorable Moment in High School Sports: "My most memorable moment was high jump at State Track my junior year, when I took second place and broke the school record. I set the new record with 5’3, and was able to finally reach my goal of beating two fierce competitive girls in my regional that I had been battling with all season." Best Part of Playing Three Sports: "There is always something new, and you aren’t doing just one sport and focusing on that year-round. 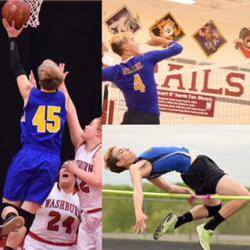 I love being a three sport athlete; being in something new every few months keeps me excited for each sport!" Toughest Part of Playing Three Sports: "You never get a break. There might be one or two weeks between sports, and your summer is usually spent staying in shape and getting ready for the next year’s battles." Favorite Opponent (and why): "Prairie Farm is my favorite opponent, because in all three sports I play, we are close-to-evenly matched. It is never a one-sided competition and we don’t have a lot of agitation with players or fans like we may do with other teams." Toughest Individual You’ve Competed Against (and why): "The toughest player I’ve ever competed against has to be Clayton Bears’ Alison Leslie. I compete against her in volleyball and basketball, and we’ve never once won a game that she played in. Especially after this last year when Alison tore her ACL in the summer, she still made everything look easy on the court. Although it can be tough always losing against a team, I will miss competing against her and her teammates every year." Most Admired High School Teammate (and why): "I most admire Sheri Clark, one of my teammates from a couple years ago. She was a senior when I was a freshman, and we were in all three sports together; volleyball, basketball, and track. She was always a positive and calm player, and knew her role. I always looked up to her, and I still strive to keep my cool like she did, and be more positive like she always was." College Plans: "I will be attending UW-Superior in the fall of 2019, to major in communicating arts and minor in studio art. I want to become an arts administrator after I graduate. I will be playing volleyball, and I will be competing with the track team as a YellowJacket." Activities Outside of Sports: "I am in the school play, and I am an active member of the concert and jazz bands. I compete in Solo & Ensemble with multiple instruments, advancing to State competitions, and I am about to compete for my fourth year in a row at the Mathletes Competition in Superior. I am also an FFA member, and I competed three years in the Poultry Judging CDE contest, also advancing to State competitions." I Find it Relaxing to: "Listen to music that others would say is not quite relaxing, like heavy metal and alternative rock." Other Family Members: Paul Skattebo- father; Amy Skattebo- mother; Caitlyn & Candace Skattebo- younger sisters; Bailee- family dog.